Always have reliable, heavy-duty electrical service where you need it with Tripp Lite's Power It!™ TLM1015NC power strip. The TLM1015NC provides 10 NEMA 5-15R outlets in a rugged, all-metal housing guaranteed to last for life. The included keyhole mounting slots allow for versatile installation, making the TLM1015NC ideal for a variety of uses including home office, workbench, point-of-sale and retail applications. With the extra length provided by the 15-ft. power cord, you don't have to install the TLM1015NC next to outlets you already have; it can be mounted across the room and deliver reliable service where you need it most. A lighted and covered On/Off switch helps prevent accidental shut offs, while a 15-amp circuit breaker guards against dangerous circuit overloads before they happen. Additionally, every Tripp Lite power strip comes with a Lifetime Warranty for guaranteed peace of mind. With its keyhole mounting slots, rugged housing, plenty of outlets and heavy-duty, 15-amp service, Tripp Lite's TLM1015NC is ideal for point-of-sale and retail applications. It provides reliable, consistent power service for multiple devices and can be used in any home office, workbench or industrial application requiring a heavy-duty solution for multi-outlet power distribution. Featuring 10 outlets compatible with all standard appliances, power tools, lighting and other heavy-duty equipment, the TLM1015NC is an ideal solution for applications requiring the distribution of power to multiple devices simultaneously. Its 17.5-inch housing spaces the outlets widely from center to center, allowing enough room for most AC adapters and transformers. Install the TLM1015NC far away from its power source and provide power distribution to previously un-powered areas with its extra-long, 15-foot power cord. The TLM1015NC can be mounted in a different area, or a completely different room, from where it draws AC power, putting you in control of getting reliable power service where you need it most. The TLM1015NC's lighted On/Off switch features a translucent cover that eliminates accidental shut-off while allowing you to see at a glance whether the unit is operational. A built-in, 15-amp circuit breaker prevents dangerous circuit overloads that could damage equipment. 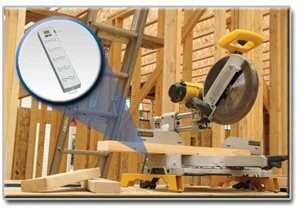 The breaker immediately shuts off AC input to the TLM1015NC when it detects that the equipment load is drawing too much power. The TLM1015NC's rugged, all-metal housing is durably constructed, making it an ideal solution for industrial, retail display and workbench applications. Safety and durability are at the forefront of the TLM1015NC's heavy-duty, all-metal construction. Get peace of mind with Tripp Lite's Limited Lifetime Warranty, which protects your product against any technical defects or malfunctions for as long as you use it.